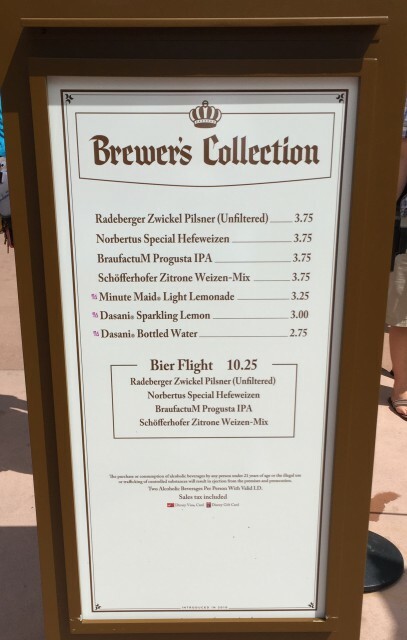 Food & Wine ’15 Menu “Recon”: Brewer’s Collection | It's "All in WDW"
I feel bad that I stopped in the middle of feeding you Epcot’s menus, but, hey, even I needed a break from Food & Wine back then! A lot of you – my friend Dennis Conroy of the WDW Main Street Podcast included – are still heading to Orlando at some point in the next month. Therefore, let me dole out the rest of World Showcase’s food! Of course, Mrs. All in WDW and I typically pass on the “wine” (or, beer, for that matter) part of Food & Wine. That doesn’t mean that the Brewer’s Collection’s menu isn’t important, however. Enjoy! ← Evan and Melissa’s Food & Wine Top 25!